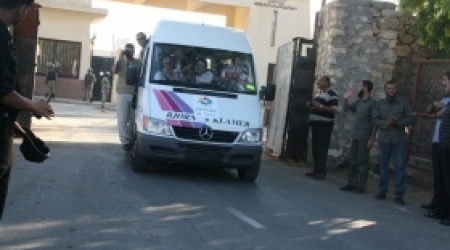 Palestinian Legislative Council (PLC) leader Ahmed Bahar has received Monday 21 activists of Miles of Smiles solidarity convoy which arrived Gaza Strip on Sunday after long hiatus. 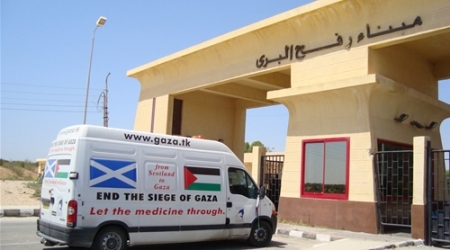 The activists from different countries include Libya, Jordan, and Britain who are taking humanitarian and medical aids to hospitals in Gaza Strip. Yousif Oujeza head of Miles of Smiles said that such solidarity convoys will continue to visit the besieged enclave to send several messages to the Palestinians that " there are people around the world will not forget you," and also to send a message to the world that "they have to force Israel to left this illegal siege." He added its not humanity that more than 1,7 still under the siege for more than 8 years in this small enclave. Oujeza explained that this convoy is one of Miles of Smiles convoys which came to Gaza to support the Palestinians in Gaza Strip and to break the longest illegal siege that imposed by Israeli occupation since 8 years ago. He called all humanitarian people to increase their initiatives and convoys that help and support the besieged people and challenge the Israeli blockade. Aojeza emphasized the Egyptian Authority promised them to facilitate the transfer of medical supplies and foods and to to ease the entrance of humanitarian convoys into Gaza. Ahmed Bahar the head of Palestinian legislative council warmely welcomed the convoy who came to emphasize their supporting and solidarity with the besieged enclave. He added that the aim of these solidarity delegations is to maintain the link between outer world and the isolated Gaza. 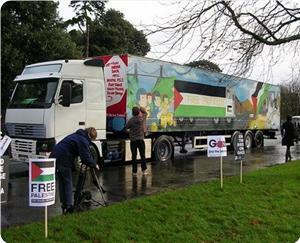 Miles of Smiles Convoy (26) arrived Thursday in Gaza with solidarity activists from 21 nations worldwide. Deputy Foreign Minister, Ghazi Hamad, welcomed the convoy's activists "Here Gaza, where we share patience and resilience,"
Hamad expressed hope that the convoy encourages other convoys. He appreciated the delegation’s determination to come to the besieged Gaza Strip, and thanked Egypt for facilitating the convoy's arrival, calling for a permanent opening of the Rafah Crossing. "The convoy stands for your reach to the free world; you are not alone facing this unjust siege,” he added. Organizers of the 26th Miles of Smiles aid campaign said the Egyptian authorities would allow their convoy to cross into the besieged Gaza Strip on Sunday, pointing to unconfirmed Egyptian pledges to open the Rafah border crossing regularly every week. Head of Miles of Smiles campaign Isam Yousuf told Al-Kitab satellite channel that their convoy may represent a glimmer of hope for the return of Gaza-bound solidarity convoys after a long hiatus. Yousuf added that the 26th Miles of Smiles convoy came to reemphasize the size of international solidarity with the besieged Gaza population. For his part, coordinator of the convoy Rashad Al-Baz said there are Egyptian pledges to open the Rafah border crossing on a steady basis during certain days a week in a move to alleviate the suffering of the Gaza population. 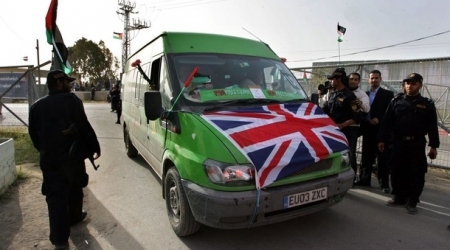 Baz noted that three solidarity delegations from Algeria, Libya and Britain would participate in this convoy. He added that the main goal of this convoy is to maintain the link between the countries of the outer world and the isolated Gaza Strip, pointing to preparations to launch another aid convoy next month from Jordan. In a related context, the Palestinian ministry of interior said on Saturday that the Egyptian authorities would open the Rafah crossing exceptionally before passengers from Sunday until Tuesday. Director of the crossings' affairs Maher Abu Sabha told Safa news agency that the Egyptian authorities told the Palestinian side in Gaza of its intention to allow Gazan pilgrims to travel to Makkah in Saudi Arab and enable other stranded passengers to return to Gaza during these days. Governmental committee to break the siege in Gaza said that ''Miles of Smiles 26'', human right solidarity convoy, is to reach Gaza next Sunday via Rafah crossing, the southern Gaza Strip. Deputy Chairman of the Committee, Aladdin al-Battah pointed out that the convoy will be charged with humanitarian aid and medical materials to the hospitals in besieged Gaza, it will also include more than 30 activists from Arab and European countries. He appreciated the Egyptian authorities' decision to allow the convoy to pass through its territories, calling to facilitate the passage of convoys to the Gaza Strip. The Commission indicated in its statistical report last January that the percentage of visiting delegations to Gaza had declined in the second half of last year by up to 95% compared to the first half of the same year. Israel has subjected the Gaza Strip to a policy of closure since 1991. However, the current, most extreme form, of closure has been applied continuously since 2007.Apart from depriving the 1.8 million inhabitants of Gaza of basic goods and crippling the economy by preventing trade with the outside world, the closure regime has prolonged the suffering caused by the Israeli attacks on Gaza in December 2008 and January 2009. Palestinian government said the number of solidarity delegations to Gaza has decreased by 95% since July 2013. Media Office of the cabinet said in a report that 218 solidarity delegations visited the besieged Gaza Strip during last year, most of which during January. The ongoing closure of Rafah border crossing, the main crossing between the Gaza Strip and Egypt, led to reduction of Arab Medical Union aids to Gaza. Director of the Union Office in Gaza, Mahmoud Abu Draz, warned of the serious humanitarian and healthy situation in Gaza, warning of the sever impact of humanitarian health crisis on the people of Gaza. He added that the Union provided last year many services and programs that supported health sector in Gaza. However, the closure of Rafah crossing in the mid 2013 reduced those services a lot. Abu Draz pointed out that the accumulation of shortages in basic supplies in Gaza is leading to rapid deterioration in the social determinants , putting Gaza puts lives of 2 million people in Gaza on the line. Egyptian Authorities still close Rafah crossing in front of Palestinian passengers and aids for the five week in a row, according to borders and crossings administration in Gaza. 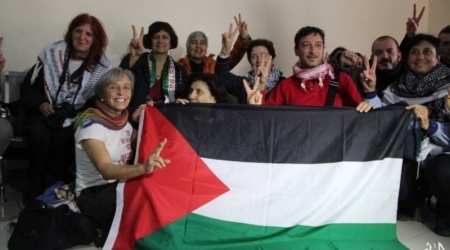 The Jordanian Lifeline for Gaza campaign said that Egypt's deportation of 58 multinational female activists from Cairo airport and its refusal to allow them to deliver humanitarian aid to the besieged Gaza Strip was a measure serving the Israeli occupation. The Jordanian campaign affirmed that among the activists were noted international female figures such as Jamila Bouhired, an Algerian nationalist who opposed the French colonial rule of her country, Mairead Maguire, an Irish Nobel peace laureate, and Medea Benjamin, an American political activist. 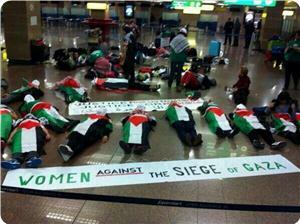 The campaign strongly denounced the Egyptian authorities at the airport for maltreating and disrespecting female activists known for advocating Arab issues, especially the Palestinian cause. It noted that the activists had received prior approval to visit Gaza and were supposed to deliver medical supplies to the besieged Gaza Strip. For his part, Hamdi Shaath, the government representative to the higher national committee for breaking Gaza siege, urged all pro-Palestinian activists around the world to activate their anti-blockade campaigns by land and sea to expose the violations committed by the besieging parties. "We call upon the world's free people to organize land and sea convoys to break the blockade imposed on the Gaza Strip," Shaath stated in a press release on Sunday. He affirmed that the resumption of anti-siege aid convoys would contribute to exposing the besieging parties, especially the Israeli occupation, and prompt the Arab regimes to assume their responsibilities towards the population in Gaza. A government committee marked a significant decrease in the number of aid delegations to Gaza during January and February. In a report monitoring the movement of aid and solidarity convoys to Gaza, foreign ministry’s ‘Government Committee to Break the Siege’ said it received three delegations of 32 members last January. The report said that the number of delegations decreased by 95% compared to the same period last year, where the committee received 97 delegations of 2500 supporters. Alaa al-Batta, a committee official, stated in the report that the Egyptian authorities refused to allow any delegation to enter Gaza despite the diligent efforts made by the committee. Batta called on Egyptian authorities to allow the Gaza-bound solidarity convoys into the besieged territory, stressing the need for Egypt to deal with this matter as just humanitarian. As part of its work, ‘Government Committee to Break the Siege’ make constant contacts with international and human rights organizations to brief them on the difficult humanitarian situation in Gaza. Gaza has been under an extreme economic blockade since 2007, exacerbated by Israel since was allowing limited quantities of construction supplies destined for international projects. Since Egyptian military’s disposition of president Morsi in July 2013, Egypt opens the Rafah crossing only for two loose days on a 10-day basis. 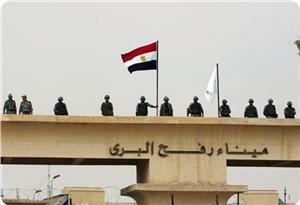 The authorities used to cite security reasons for the Rafah border closure. Applications for travel has been closed for weeks so far after the number of Gaza applicants reached 5000, according to the interior ministry. 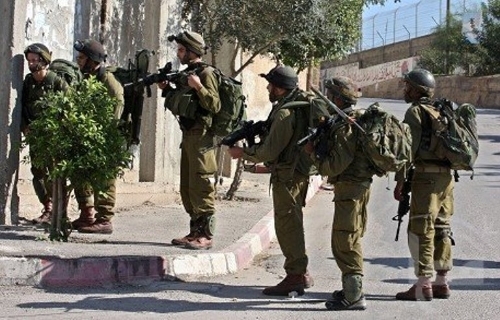 This Thursday, Israeli forces handed out 12 demolition orders to Palestinians residing in the village of Sa'ir in the southern al-Khalil hills close to Hebron. The Israeli military has closed the village and given the residents one month to file a complaint before carrying out the demolitions. Human rights groups say that the demolition orders are part of a strategy by the regime in Tel Aviv to annex the southern al-Khalil hills to Israel and a greater strategy to maintain military control over the Jordan Valley, the Negev and the southern al-Khalil hills, Press TV reports. This week, Israeli forces demolished dozens of Palestinian homes in the Jordan Valley, leaving villagers without shelter in the winter cold. Also, Israelis have seized all human rights aid as well as shelter that was handed out to the Palestinians. 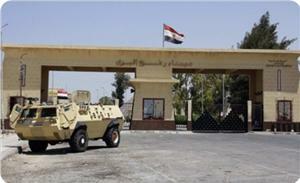 The Egyptian authorities banned the entry of a Jordanian delegation into the Gaza Strip via the Rafah border crossing after more than ten days of waiting at El-Arish city. The government committee against the siege in Gaza said in a statement on Sunday that the five-member Jordanian delegation led by Sheikh Hazem Abu Ghazala had arrived in El-Arish city on 30th December and stayed there waiting for allowing them access but to no avail. The committee denounced the Egyptian ban on entry of the delegation, demanding a full opening of the Rafah terminal and allowing all delegations free entry into the besieged enclave to extend badly needed medical and humanitarian aid especially after the severe losses suffered during the recent cold spell that hit the Strip. The committee asked all free people of the world and heads of previous aid convoys to Gaza to reactivate those aid convoys and solidarity delegations to alleviate the suffering of the Gaza population. 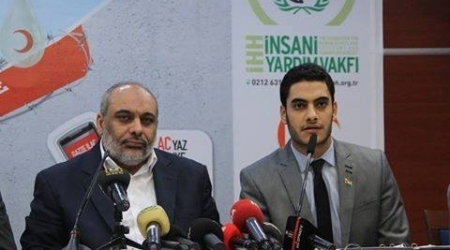 The Palestinian Student Forum in Turkey, in cooperation with IHH (The Foundation for Human Rights and Freedoms) launched urgent fundraising campaign for purchasing medicines for the Gaza Strip. Karim al-Astal, the chairman of the Forum, said ,in a press conference held in Wednesday that the siege imposed on the Gaza Strip continues and the borders have been closed for 190 days; pointing out that more than 65% of necessary medicines run out of hospitals and pharmacies. The camping will lasted for three months and will include night receptions and programs about the Palestinian issue. Al-Astal affirmed that the Israeli occupation is responsible for the humanitarian crisis resulted from imposing siege on 1,700,000 people in the Gaza Strip. Bulent Yildirim, Head of IHH’s Board called Israeli occupation to allow the entry of medicine and other humanitarian aids to the Gaza Strip. Yildirim said that his organization will later on announce the details on how it will deliver the medicine to the Gaza Strip. The Insani Yardim Vakfi (IHH) sent Mavi Marmara flotilla to the Gaza Strip in 2010 to break Gaza siege. The aid flotilla, which carried more than 500 solidarity activists, was attacked by the Israeli navy. Nine Turkish were killed and other 50 wounded. 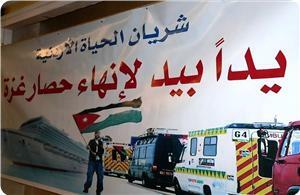 Chairman of the Jordanian Lifeline Committee Wael al-Sakka said that a delegation of Miles of Smiles convoy is scheduled to travel to Egypt in the coming days to find out reasons behind the Egyptian rejection to the convoy’s entry to Gaza. Egyptian authorities have approved earlier the entry of the aid convoy to the besieged Strip, al-Sakka explained in a press statement, adding that Miles of Smiles convoy includes different international delegations including the Jordanian Lifeline Committee. “We were surprised by Egypt's decision to suspend its previous approval”, he said, pointing to the international convoy's intention to send a delegation to discuss the Egyptian new decision. Al-Saka stated that there was an Egyptian approval to allow the entry of the relief supplies needed in the Strip especially after the latest winter storm, without allowing the entry of the aid convoy's members. Informed sources told PIC that the Egyptian authorities have not allowed International Lifeline Convoy to enter the Gaza Strip. 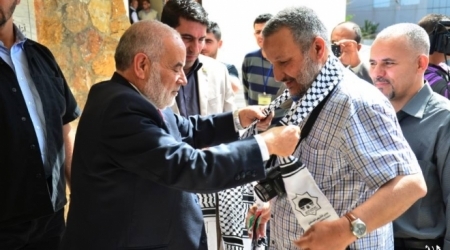 A delegation from Jordan Lifeline Committee of about 20 partisan figures is slated to participate in the international aid convoy to the Gaza Strip. The convoy will also include about 100 international solidarity activists representing Miles of Smiles Campaign, the European al-Wafaa campaign, Ansar convoys, and the relief committees of Algeria, Libya, Bahrain, and Malaysia. It aims to deliver aid to Gaza to alleviate the repercussions of the winter storm that hit the Strip recently. A number of Arab and Islamic relief organizations and institutions have launched an emergency appeal calling upon the Egyptian government to open Rafah crossing, and urging the Egyptian relief committees and competent authorities to contribute in the relief efforts to help Gaza people. A report that was issued by Gaza government has recently announced that the direct material losses of the stormy weather that hit the Strip were estimated at 64 million dollars. An Italian solidarity delegation arrived Thursday evening in the Gaza Strip via the Rafah crossing to check on the humanitarian situation across Gaza’s five governorates and refugee camps. ALRAY reporter said the delegation is composed of 27 activists who donated medicines to the health sector, noting that they would meet a number of government officials, representatives of factions and civil society and human rights organizations. The delegation arrived after the Egyptian authorities exceptionally opened the Rafah crossing to them on Thursday evening. Member of the delegation Morinco Musolino said to ALRAY that “we are making this visit to consolidate the issue of the Palestinian refugees scattered in Lebanon, Syria, Jordan and Palestine, noting that there are many activists working for the right of Palestinian refugees to return to their original homes. "We managed today to enter the Gaza Strip after a very hard week, but the difficulties we faced are nothing comparing to what the Gaza people suffer of Israeli occupation violence and oppression," he added, stressing the need to lift the blockade of Gaza so that their people can move freely. "It’s not accepted that Gaza becomes an open-air prison, and we will fight for the independence of Palestine," Musolino said. The Gaza crossings administration said a few days ago the Egyptian authorities refused to cooperate in entering three solidarity delegations including an Italian. Director General of Border Crossings Maher Abu Sabha said "the Egyptian authorities did not respond to our request for allowing access of three solidarity delegations to the Gaza Strip via the Rafah crossing,"
The Rafah terminal saw frequent closures since the Egyptian military deposed the freely-elected President –now detained- in a coup against his rule in early July 2013. Since then, Egypt has repeatedly closed the Rafah border crossing, leading to an extreme decline in the number of solidarity and aid delegations coming to Gaza.